Opera on Tuesday announced two new products - a new mobile browser called Opera Touch and an updated Opera browser for desktops. Opera says the Touch browser has been designed from the ground up and it can connect with the updated Opera PC browser without setting up a password or login. The highlight of the new Opera Touch is that the navigation has been designed to be used with just one hand, making it easier for users to browse the Internet. The Opera Touch browser starts in search mode, ready to look for things on the web. The keyboard will already be up and the address bar cursor will blink to indicate URL or search entry. "We have moved the browser's key functions within your thumb's reach," said Maciej Kocemba, product manager at Opera. "This means that, unlike in most other browsers, you can more easily browse and search the web when on the move." Additionally, there is a Fast Action Button (FAB) at the bottom of the screen, for the one-handed browsing experience. The new feature provides direct access to the most recent tabs and a search feature. It also enables the user to navigate through the browser using the thumb. The Opera Touch also supports voice search and lets users scan QR and barcodes. With this feature, when you see a product in a shop, you will be able to check its reviews online. The other key feature of Opera Touch is called Flow, which lets you send files, notes, and links to your PC. Flow is end-to-end encrypted, and unlike other browser synchronising tools, you don't need to create a login or password. To access Flow, you will have to scan a QR code displayed in the Opera computer browser with Opera Touch. Meanwhile, the Opera browser for PCs has also been updated. It comes with an Instant Search feature that lets users quickly search the web and their open tabs. You can just use the shortcut ALT + Space or the button in the sidebar on any page to start searching. Opera Touch is available for Android on Google Play and it will come to iOS soon. 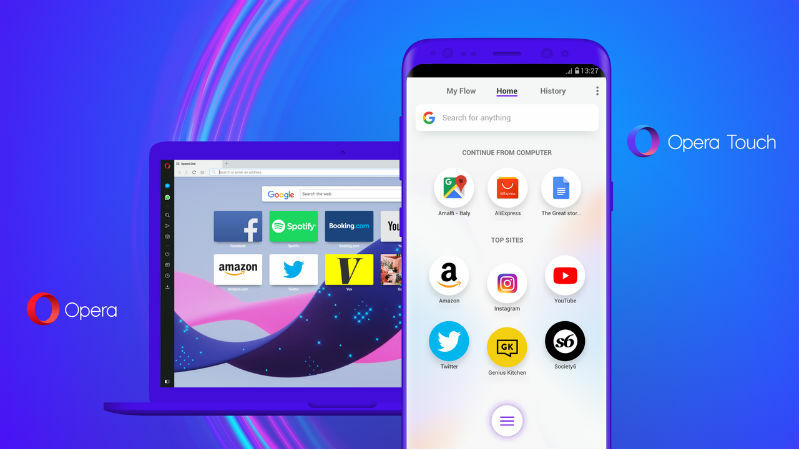 To use the Flow feature, you can download the latest Opera browser on your Windows, Mac, or Linux PC.